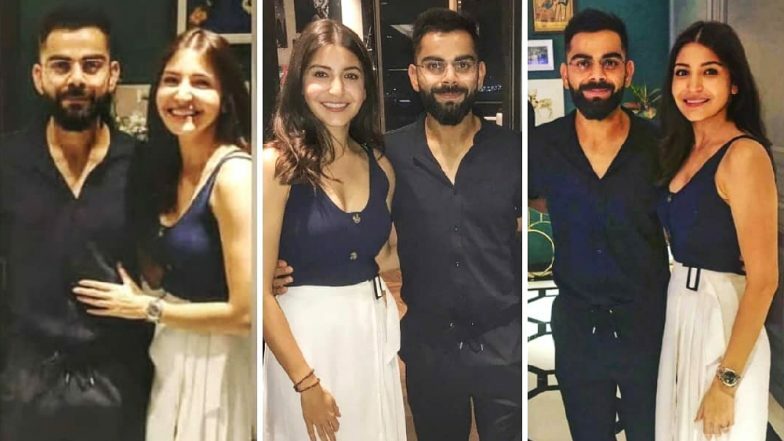 Anushka Sharma and Virat Kohli are social media’s favourite. One picture they post, and it takes the internet world by storm. The last time that Anushka had posted a picture with her better-half was almost a month ago. The latest photo of the duo that has hit the internet is the one where they hosted a special dinner for the entire team of Royal Challengers Bangalore. Anushka Sharma Has Literally Changed My Whole World, Says RCB Captain Virat Kohli; Watch Video. Some of the team members of Royal Challengers Bangalore have also shared pictures on Instagram. Virat Kohli and Anushka Sharma sported smart casual avatars. There are pictures been floated in which team members have thanked the lovely couple for hosting the dinner party. Seeing Virushka’s pictures fans started commenting, “Togetherness”, “Virushka looks so beautiful in all pictures of them, they are so happy with each other, virushka are the best celebrity couple in the world”, “finlyyyy”, and much more. This Video of Anushka Sharma Proves She Has No Plans to STOP Working. It was just yesterday when Anushka Sharma teased fans with a boomerang video in which she was seen in front of the lenses. That just made clear that she has no plans to quit working. Anushka was last seen in Zero that miserably tanked at the box office. We just can’t wait to know which would be her next Bollywood project!